The area that is now occupied by the City Hotel was formerly several distinct lots. The south lot was a blacksmith shop in the early 1850's. By 1854 Louis Heynemann was running a Lager Beer Saloon in a brick building at this location. The building remained a saloon until 1860 when Seamer Hughes moved his tinware, lamps, stoves and hardware into this location. In 1865, George Morgan bought the brick building and a one story wooden structure located on the property. The north lot was bought by George Morgan in 1854. A wooden structure was built on this lot sometime prior to 1854. From 1856 until his death in 1891 George Morgan continued to add onto what would become known as "Morgan's City Hotel." Besides a hotel, parts of the structure were used for an auction house, a theatre, music hall, bar, restaurant and living quarters for Morgan and his family. After his death, Morgan's family continued to run the hotel until 1911 when the Morgan Family sold the structure to Dante and Mary Cinelli. In 1947 the State purchased the building for inclusion in Columbia State Historic Park. 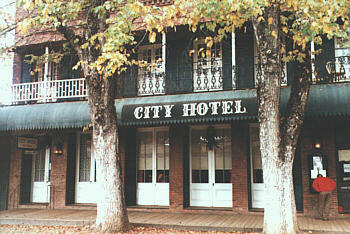 In 1975 the State completely renovated the City Hotel structure.